She also learned to access her own dark side. 'Since I became a mother, I'm more capable of immersing myself in a darkness that I experienced before in my life. But not to this extent. But now I know how to come out of it. And that's really exciting. 'Cronenberg's creative team collaborated closely with the director to achieve a unique look and sense of place, but one that grows progressively darker as the film's events unwind. The costume concept drew on a Middle America look based on a small conventional American town of approximately 1,600 inhabitants, explains Cronenberg, whose colour palette for Maria Bello was warm autumnal colours - browns and beiges. Production Designer Carol Spier's colour palette was light and airy, but it gets progressively darker and more intense. 'The mood is idyllic, setting up the violence. It's a safe protective environment with no bars on the windows. Doors are left unlocked in contrast to Richie's deep broody mansion,' says Spier, who has designed 12 films for the director. As it's main character study, it's a fairly straightforward film in terms of the sets we built,' says Spier. The exterior of Richie's mansion, a replica of a French chateau, formerly a Canadian tycoon's home and now part of York University, was filmed outside Toronto. The interior was built in studio at Toronto Film Studios. 'The mansion was played as a bad guy's hangout, so it is very masculine with deep colours, a world removed from the bright Indiana town where Tom Stall runs his diner. The dichotomy was the light and the dark, as the main character's emotional state turns from light to dark,' says McAteer. Cronenberg's specifications for the Midwest American town and the Stall's farm was that they had to have an extremely rural look with a picturesque vista and rolling hills. The rural town of Millbrook, Ontario, was selected because it nestled in a secluded valley, with a main street swooping up the hills on either side. 'It had a small town feel and retained period buildings,' explains Location Manager Debra Beers. Dating back to 1816, when the first mill was built, Millbrook's architectural heritage features a variety of building styles typical of 19th century Ontario. The village remains much as it did 100 years ago, describing itself as 'a legacy to Ontario and small town life.' The farm satisfied Cronenberg's bucolic yearnings, and to match Toronto to a seedy section in Philadelphia, the production returned to a bar used in The Fly. The 14 locations radiated out from Toronto for up to 90 miles. After shooting the exterior of Stalls' diner in Millbrook, the production rebuilt the stores and street in studio right down to such details as cracks and crevices on the tarmac road. Other scenes were shot in a mall open to the public in the small town of Tottenham. A baseball game was filmed in the tiny town of Pottageville. Beers returned to an eXistenZ location. 'At this point in my career, I realized that the greatest thing I could do is surround myself with people who are really excellent at what they do. After seeing David's movies and reading the book Cronenberg on Cronenberg, you realize what a master he is,' says Maria Bello. Adds Cronenberg, "Actors are the custodians of their own characters. As a director, you really should listen to that. You should allow them to be alive and to collaborate with you. Ultimately you realize that your best collaborators can be your actors." The director creates an environment for himself and then for everybody else which is very welcoming and encouraging. "When I invite actors or crew to work on my movies, I feel I am asking them to play in my sandbox, because there is a sense of play, We are throwing things around and crashing things, we're playing. You cannot lose that childlike sense of play that is at the center of creativity." Mortensen points out," David is definitely someone who is a collaborator and more importantly, makes the actors and the crew feel like they are on a team. He is a director who understands that simple is complicated and that complicated should be simple. That is the hallmark of most of his movies. His stories are really subtle in a deft and uncluttered way. They allow us to look at things that normally we don't look at which are uncomfortable to deal with." Producer Chris Bender notes, "David doesn't get rattled by little things, He has this incredible kind of silent power, a Zenlike attitude, which allows everyone to work at their peak in terms of their creative input. He also has a very a clear vision and that clarity is his strength." "David has a tremendous love for his actors," continues Bender. "He really respects and appreciates what they bring to the process, so they feel really comfortable to do what they need to do to explore the character, and he lets them. And then, at the same time, he is able to get exactly what he wants." William Hurt couldn't agree more. "David has a great sense of tenderness when you're working with him, At the same time, a great sense of strength. He has that sense of being able to be in control of his vision at the same time as being very very tender about communicating it. So there is a sense of collaboration instead of intimidation,"
What impressed Hurt was the "smoothness" of the set, "You weren't directed so much as you were permitted. It was very surprising to me to feel such ease so quickly, I think that was because 1 knew he wanted me to go all the way. David is completely focused, And it's a great feeling to be with that depth of concentration." Ed Harris adds, "The set is very, very low key. There's no question who is in control, but there is a shorthand because they have all worked with each other before. And so it's a nice environment. One of the more pleasant aspects of it was obviously the people working on the film wanted to be working on it, and had worked for David before. There was a great sense of camaraderie and everybody working for the same purpose. I guess if I was surprised by anything, I felt very welcomed and comfortable." Echoes Ashton Holmes: "The environment that David creates is very welcoming, There's not sense of tension; it's a level playing field for everybody involved from the AD's to the actors." Even young Heidi Hayes, whose parents run The Central Ontario School of Falconry, got into the spirit and to surprise Mortensen on his birthday, brought her pet barn owl, called Lucy, to set and showed Mortensen how to place it on his gloved hand. The animal theme prevailed when the film shoot drew to a close. Throughout the shoot, each time Mortensen went to visit his mother, he'd purchase T-shirts sporting various types of fish logos, swimming in turbulent streams. On each visit, he purchased more until soon, nearly the entire crew was garbed in fish T-shirts. Fish Fridays became an event. But the fishiest event took place for the crew group shot when Mortensen and Bello presented boxes of fresh fish so various crew members could hold the red snappers up for the camera, gingerly clutching them between thumb and forefinger. Mortensen, usually unassuming, flourished a flounder - the "big fish." It was all a bit whiffy, but a wonderful indicator of the camaraderie which prevailed throughout the shoot. Reflecting on the film's theme, Maria Bello says, "Do we ever really know anyone, do we ever really know ourselves? I think it's just a continual process of revealing ourselves to ourselves. And in the process, being able to have the courage to reveal ourselves to someone else." William Hurt poses the question, "Can you change who you are? Is violence, once it's part of your life, inescapable? I think that this film is so powerfully, stylistically made, that the answer to that question is going to be evident." Screenwriter Josh Olson concludes, "I'm fascinated by the fiction of everybody's life. Having to come face to face with who you are is a really interesting topic for drama." Bello advises, "You have to be constantly on the alert because David goes down a windy road. You don't know which way he's going. There's real violence and blood, and then there's real love, kindness and compassion. It's such a mix of human emotion. I think people will be taken on a journey." Ashton Holmes adds, "What I think makes it really compelling is the fact that as an audience, and also as an actor in the story, you're able to really explore the notion between good and evil, and how that plays out in individuals,"
"Violence is something that is part of human nature and human history that demands exploring. It's in the newspapers and in our minds every day. So you artistically and creatively feel it's something you have to come to terms with, and hope you deal with it in your creative life and not have to deal with it in your actual day-to-day life," says Cronenberg. 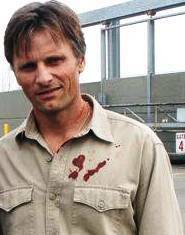 Viggo Mortensen sums up, "David puts a magnifying glass on society and culture in the United States showing in subtle ways the universal themes of the nature of violence, the confusing aspects of the nuclear family and individual identity."